Last year I connected with a beautiful, eleven year old girl, who has the dream of becoming a teacher. She was so smart and kind, and I loved spending time with her. When a team went back to Myanmar in August, they found out that this little girl, Marry Tun, was no longer at Love Children’s home and had gone back to live with her family. This should be great news. I should be happy that she has been reunited with her family. But this wasn't the way I felt at all. All I could think, was that I would never see her again. 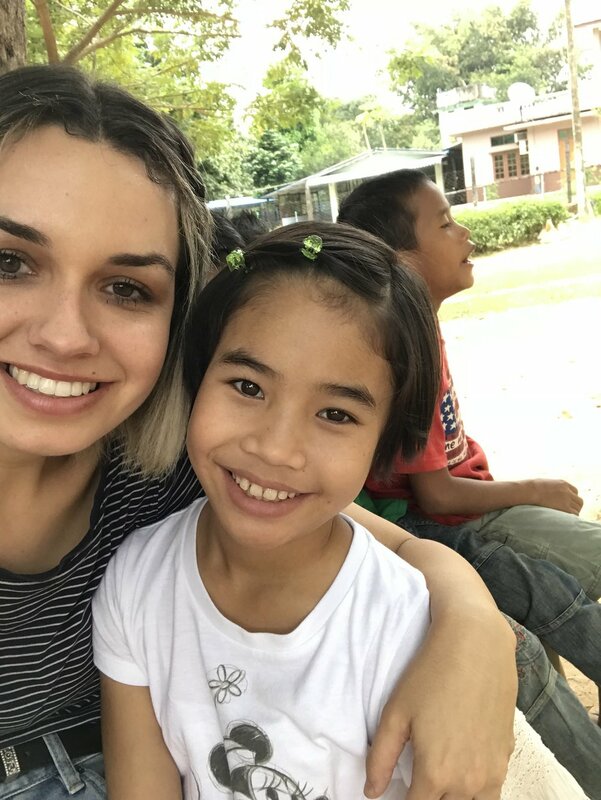 I felt such a strong connection to her, and I couldn't believe that she would never return to the orphanage. Before I left for Myanmar this year, I was shopping for Christmas presents for my boys at the orphanage. While at target, I started to feel sad, reminding me that my little girl wouldn’t be there this year. I was passing by the selection of toys they had for the girls, and I wanted so badly to be buying girl presents too. I called my boyfriend, and told him of my almost melt down in target, passing through the girl section. He told me that I should buy a girl present anyway, and pray that God brings me a new girl to be close with this year. He’s the best-- right?! Anyway, I began picking out toys, and dolls I think she would like. I bought a pink jacket, and minnie mouse shirt, and hair clips for her. I prayed every night that God would bring me a new girl that I could be close with, and sponsor. When I got to Myanmar the first day, I stepped off the bus into the crowd of kids. I was looking for my boys, and I couldn’t find them. There were kids grabbing my hands, and legs, and arms, as I walked off the bus, some I remembered from last year, some new. One of those little hands that grabbed mine, belonged to a little girl named Christina. The cutest, most beautiful little girl. Her smile so big, and genuine. She stayed by me all day, and every day after that. Immediately, I knew that she was the girl I had been praying for. Everyday she would come running to me, and grab my hand. She always wanted to be next to me. There is something beautiful in the connection between a woman and a little girl. My whole life, in every season, there has always been a woman I’ve looked up to. It’s been an important part of my growth as a person, and a Christian. Through every age, there has been a woman who has encouraged me, and supported me during that time. I wanted to be this for someone. This is why I prayed so intively for God to bless me with a little girl. Having another woman believe in you, support you, and listen to you has changed my life. It means so much to me, knowing I have someone backing me up, and loving me in all of my faults. No matter how much you think you know, there is always someone older and wiser you can learn from. I knew how important it was for me to have a woman support me, and love me. I loved having a mentor I could trust. This was my prayer, that I could become that for her. I love her. She is the cutest, sweetest girl. She loves me. I want to encourage her, uplift her, and remind her that she can do anything in the world. I want to be an inspiration to her, and be apart of this stage in her life. She is young and seven years old, but I hope she remembers me, as I will remember her. She wrote me a few letters while I was there. If you didn’t know this already, letters are my love language and I love receiving them. In each of the letters she expressed her love for me. In her latest letter, she told me I was her best friend. It brings me to tears. I dreamed of this. I longed for this, and now this little girl is telling me that I am important to her. On the second to last day I gave her the presents I bought her, and on the last day I was there, she wore them. The shirt, was a declaration to a promise, I believed God would fulfil. It was God telling me, Taylor I know the deepest desires of your heart, trust me. I could elaborate further on this, but I’ll leave you with this. Nothing is too big or small for God. Pray for it. Whatever it is. God answers prayers, and there is so much beauty in God revealing his best. That little girl is in my thoughts and prayers every day. She’s proof of God’s love for me, and I hope I am proof of God’s love for her. He never fails me, and he’ll never fail you.